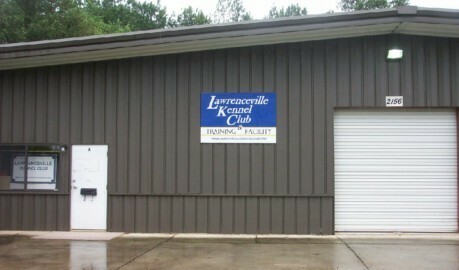 The Lawrenceville Kennel Club invites your group to consider our training site for your next event or meeting whether for a seminar, match, show and go, or training session. Our training building is a 4,400 square foot indoor facility with heat. There are two fully matted rings, restrooms, chairs and a PA system. Our building is located in Lawrenceville, GA at 2156 Oakland Industrial Ct. It is easily accessible from HWY 316 and Sugarloaf. We are snuggled in a small industrial park that is quiet, with little traffic. Weekend rental is $125 per day or $75 per half day use. A 50% non-refundable deposit is required at the time the contract is signed. Proof of liability insurance is required from the contracting club, with LKC listed as an additional insured.